She sets a thief to catch a thief. Will he also steal her heart? Private investigator Helen Hu must team up with art thief Reuben Costa to rescue her mother, who has vanished while trying to make amends for stealing some bejeweled eggs fifteen years ago. 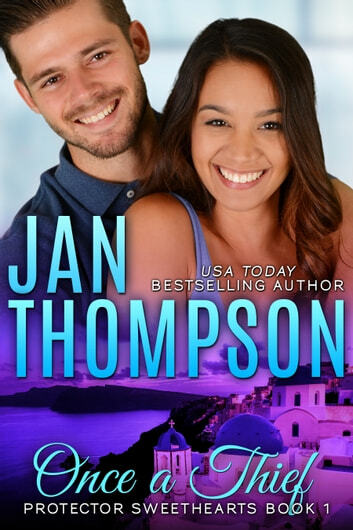 ONCE A THIEF is book 1 in USA Today bestselling author Jan Thompson’s Protector Sweethearts, a Christian romantic suspense collection that showcases unsung heroes and heroes behind the scene. This series is a spinoff of Jan’s Savannah Sweethearts series, and is a sister series to Vacation Sweethearts. To protect the woman he loves whom he could not have because she is another man’s wife, Reuben Costa’s father goes to prison for a crime he did not commit. When his father dies in prison, Reuben vows to never love or marry. Reuben pours the next several years into expanding his father’s art theft organization across Europe, all the while sacrificing his own personal happiness. Bitter and burned out, he lives in the shadows and moves around at night, until the FBI Art Crime Team and INTERPOL catch up to him and send him to prison. Five years into his incarceration, he gets a visit from INTERPOL and his FBI nemesis. They offer him an early release from prison and a new life as a free man in exchange for helping them shut down some jewel thieves even more notorious than his own father had been. The work is done, and Reuben is now a free man. When Helen Hu decides to open a branch of her Hu Knows, Inc., private investigative firm in Europe, she thinks she will send someone else to run the office and liaise with INTERPOL. Little does she know that she will have to go to Europe herself. Instead of Brussels or Frankfurt, as she planned in Love You Always (Savannah Sweethearts Book 6) or Vienna, where she went in Share with Me (Seaside Chapel Book 1), Helen ends up in Greece, an old family vacation spot frequented by the Hu family when her father was alive. Past memories have never been darker for Helen as she deals with a long-lost secret that her mother—known as Mama Hu—has hidden from her for fifteen years. Afraid it will shame her daughter, Mama Hu tries to fix what she has done and redeem herself. And, as Helen fears, she disappears. The best way for Helen to rescue her mother is to go underground where thieves and robbers live. Her only ticket into that nefarious world is another art thief. He says he is reformed. Or is he? As Helen and Reuben rush to rescue Mama Hu before the matriarch gets herself killed, the unlikely partners end up bargaining for not only life and death but also their own hearts and souls. The events in Once a Thief happen after these novellas and novels, where Helen Hu makes cameo appearances with speaking parts. In fact, Tell You Soon is where we first meet Mama Hu. Once a Thief is a Christian romantic suspense novella and can be read on its own without your having previously read any of the above books from Jan’s contemporary Christian beach romance collections.